Social Work in Health Settings: Practice in Context maintains itsuse of the Practice in Context (PiC) decision-making framework to explore a wide range of social work services in health care settings. The PIC framework is used to cover a broad range of social work practice sites, settings and populations over 30 case chapters. Fully updated to reflect the landscape of health care provision in the US since the Affordable Care Act was passed, the cases are grounded by ‘primer’ chapters to illustrate the necessary decisional and foundational skills for best practices in social work in health settings. The cases cover working with both individuals and groups of clients across the life course and the PiC framework helps maintain focus on each of the practice decisions a social worker must make when working with a variety of clients from military veterans to HIV positive children. The ideal textbook for social work in health care and clinical social work classes, this thought-provoking volume thoroughly integrates social work theory and practice, and provides an excellent opportunity for understanding particular techniques and interventions. The new edition of this classic text offers the most comprehensive and insightful analysis of social work practice in health care found in any textbook. The cases are new and discuss cutting-edge issues including transgender health, genetic testing and counseling, immigrant health, and international public health. Of particular value are the discussions of each case that identify new learning and that model reflective practice skills. Because it presents contemporary issues influencing the context for, and the process of, social work decision-making in the accessible form of case studies, Social Work in Health Settings is strongly recommended as a textbook for students as well as advanced practitioners. 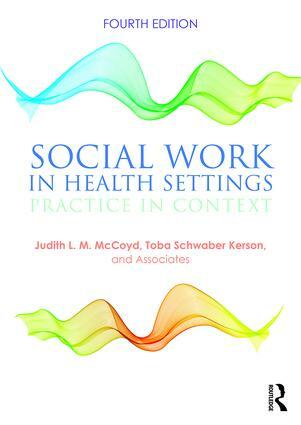 The 4th edition of McCoyd and Kerson’s Social Work in Health Settings makes a strong case for its impact and utility for social workers in health care. This well-written and consistently edited book allows each contributor to speak in her own voice. The range of settings and social work roles presented expands our understanding of social work in health care while the casebook format helps the reader to see reflective social workers in action. Social work educators will also find the book useful for teaching generalist social work practice. Judith L. M. McCoyd, Ph.D., Q.C.S.W., L.C.S.W. is Associate Professor of Social Work at Rutgers University, The State University of New Jersey, USA, with a focus on clinical practice, loss and grief, and interprofessional education. Toba Schwaber Kerson, D.S.W., Ph.D. is Mary Hale Chase Professor Emeritus in Social Science at the Graduate School of Social Work and Social Research, Bryn Mawr College, Bryn Mawr, Pennsylvania, and a Fulbright Specialist.